CAMRA Durham promotes real ale and pubs across most of County Durham, supporting breweries, pubs and their customers. The branch holds frequent socials and day trips, and organises the Durham Beer Festival. Our monthly branch meetings are held in good pubs across the county. Transport from Durham City is often provided, and additional pickup points can be arranged if they are close to the route – please contact the Social Secretary if interested. CAMRA Durham is part of the national organisation CAMRA Ltd (the Campaign for Real Ale). You can find out about CAMRA, and join if you wish, at www.camra.org.uk. New CAMRA members are automatically enrolled in the branch in which they live, but can change to a different branch. If you would like to become a member of Durham CAMRA, please contact the Membership Secretary. For details on how the Durham branch is run, please see the Branch Constitution. 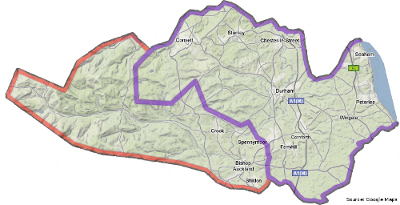 The Wear Valley branch merged with Durham CAMRA in 2010, so Wear Valley (shown in red on the map) is now supported by Durham CAMRA. The Teesdale area of the county is part of Darlington CAMRA. Follow @CAMRADurham on Twitter.